interested in working with us as a postdoc, Ph. D. student or an undergraduate. December 2018. A very big deal for us - GuGu's paper on cellular geometry scaling has been accepted for publication in Nature Communications! It's beautiful! UPDATE, JANUARY 2019: here is a pretty little summary of this work! August 2017. It's been a year since our move to the Crick. To mark the occasion, see Risa explaining why we use yeast systems to understand cell biology - together with Frank Uhlmann. With tantalizing glimpses of S. japonicus! June 2017. One more collaborative paper with the Balasubramanian lab - on the role of actin turnover in actomyosin ring constriction - now published in The Journal of Cell Biology ! Also, see Snezhka's ode to comparative biology of fission yeasts in BMC Biology, as contribution to Forum on Non-Model Model Organisms. October 2016. We have been collaborating with the lab of Mohan Balasubramanian in University of Warwick on the mechanisms underlying actomyosin ring contraction - here is our first collaborative paper in eLife! 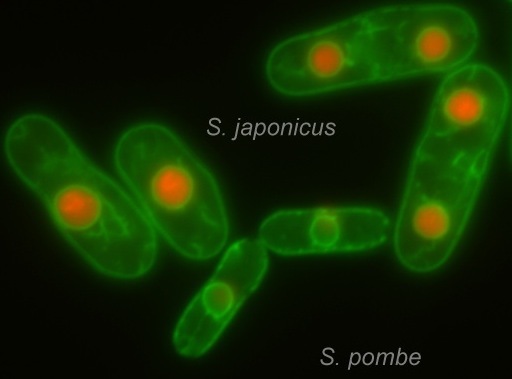 It's all Mohan's lab achievement of course - we (Ying Gu) did S. japonicus genetics for this story. August 2016. WE MOVED TO THE CRICK! See the movie of our move produced by Risa! July 2016. Now, this is major! We are EXCEEDINGLY proud of Gerard Pieper who was awarded a highly competitive Boehringer Ingelheim Fonds PhD fellowship to work in our lab! April 2016. And here is the story of our move to London, featuring Ying's Christmas screen ;) Pages 26-29. January 2016. Here is our first major news of 2016 (and the very first on our brand-new website) - we just published a cool story on evolution of nuclear envelope expansion in Current Biology! Masha Makarova collaborated on this project with Ying Gu and Kathy Gould's lab at Vanderbilt University. Also here is a wonderful Dispatch on our paper by Rupali Prasad and Yves Barral! And here is a short write up in Science as an Editor's Choice! !